Haven't Got Time For The...strings? Haven't Got Time For The ....strings? Next week, I am playing a private event with Carly Simon in LA, so I spent the flight brushing up on her tunes. I am returning to the 2nd keys chair, which is what I played on her tour in 2005. So, I will be covering mainly string parts. I thought I'd start with the heavy string tune, "Haven't Got Time For The Pain". This has always been one of my Carly favorites and is also so fun to play. 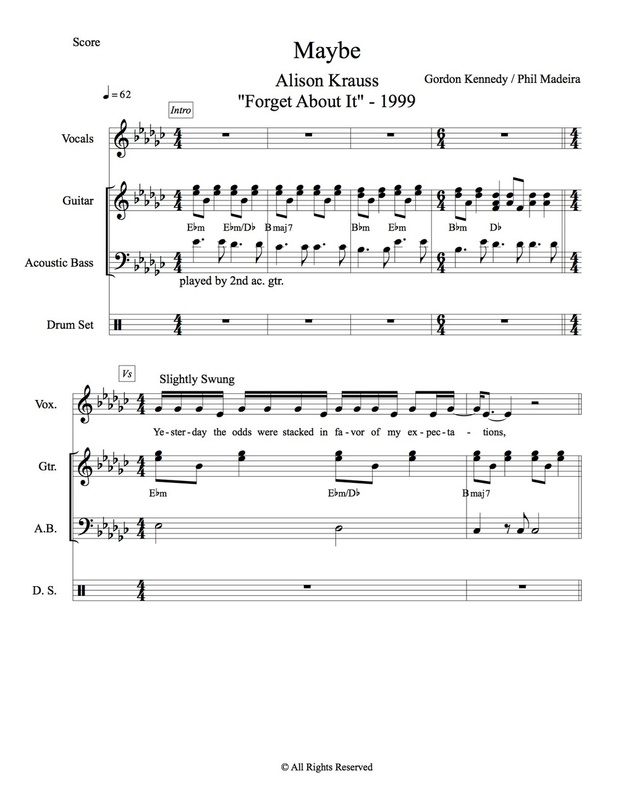 I remember learning the song, but that was eight years ago and this recording is known for its string arrangement. I decided to make this blog's analysis a study of the string arrangement. One thing I have been pushing myself to do is to internalize my musical thoughts and to conceive ideas that come organically from my voice instead of executing simply what my fingers feel like playing. As I was studying the various string parts, I not only noticed reoccurring motifs (which is natural in music), but discovered how the string parts echo the lyrics. On the second chorus (56"), the strings double Carly's rhythm on "got time" and then answer with a 16th note motif that echoes the phrasing of the lyric "haven't got". On the third chorus (2'11") , there is an 8th note figure that echoes "for the pain". Between these three motifs, the strings are repeating what Carly's singing, almost like background vocalists would. So that was maybe a bit of the music nerd in me talking. I would also like to point out how aesthetically the verses and choruses change in mood. The strings in the verses are for the most point lush sustains. In the verses, Carly describes her pain, and on the chorus she declares how she simply doesn't have time, room or need for the pain. First of all, wow....what a powerful lyric! Now notice the high trill towards the end of that phrase. When I hear that, I imagine all of the weight of the world barely hanging in the balance. This musical phrase at the end almost sounds like a second melody and again (2'48"), notice how naturally the lyrics fit within. It develops later into this contrapuntal (opposite directions) open sounding voicings (a la Copland). Not a string part, but I love the shaker and little bell. I hear a typewriter (what's that?) when I hear this ending. Maybe the arranger was trying to mimic sounds of an office or the stresses of that evironment. There you have it. My analysis of Haven't Got Time For The Time. Enjoy this song and I encourage you to hear my string arrangements on her Grammy Nominated, Moonlight Serenade album. Anywho...Alison is one of those artists who's as close to perfection as you'll find this side of heaven. 1) Listen to this track one time with no agenda. How's it feel? There is this vacillation between straight and swung rhythms between the band and Alison's melody. The intro is a simple 8th note guitar part. Nothing fancy and pretty even. Then enters Alison's vocals; a subtle swing created by her syllabic stresses and by her 16th note placement, but still, nothing too out of the box. 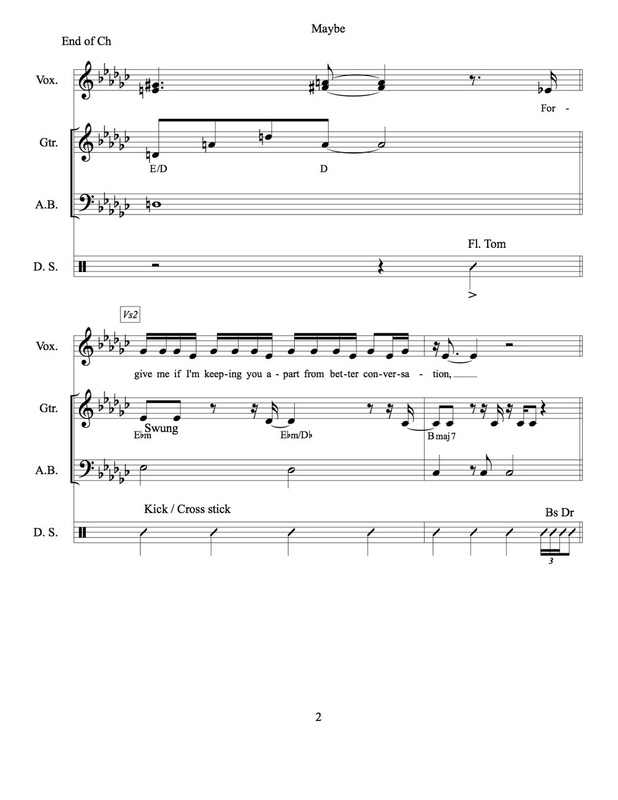 Page 2 brings us to the last bar of the chorus going into the 2nd verse. Jim Keltner, on drums, makes a strong statement with his floor tom entrance on the last beat before the 2nd verse (1'21"). And here is where the fun begins! Jim and (I believe) Jerry Douglas (guitar) begin a "conversation" based on Alison's phrasing. I put "conversation" in quotes because of its use in the 2nd verse's lyric. The guitar is landing on very calculated subdivisions of the measure, flirting between the straight 8ths of the original guitar part and the swung 16ths of Alison's vocal. And Jim responds to Jerry's guitar with a triplet bass drum fill after 2 measures of straight quarter note time on the bass drum and cross stick. The song continues with this back and forth straight/swing feel, all within the wide palette of 62 BPM (beats per minute). I miss CD, cassette, vinyl, etc...any format that listed credits on an album. Thank goodness for wikipedia. All that to say, please look up the personnel on this project (and other recordings). It is no surprise why this track has an undertone of "funky". Jim Keltner is a legendary session drummer with credits with Chicago, Booker T. Washington, Steely Dan and John Lennon. And I had the great fortune of playing with Alison's brother/bassist, Viktor Krauss on the Carly Simon tour. I wish I had owned this album when I worked with him. I knew who his sister was (they're practically identical), but was not yet familiar with her music. I have just returned from a tour of Australia, and on one of the recent flights, I was in a "Miles" mood. (No pun intended.) I dialed up Miles Davis' '58 Sessions album on my iPhone and started with track 1, "On Green Dolphin Street". Do you ever have one of those "a-ha" moments when you notice something new from something you've heard a thousand times? Well, I had one of those. Something about Davis' melody and solo really captured me. So, returning to my flight, I decided to take out my handy Moleskin staff paper notebook, (thanks mom), and start transcribing. Although I'm familiar with the melody, I decided to take down Davis' interpretation of it along with his solo. Davis' melody in many ways showcases his musical identity and sense of improvisation as much as his solo. And many of the ideas and motifs used in the melody are found again in his solo. I am going to address three musical points in this analysis, melody, rhythm and wrong notes. Anyone who is familiar with this song would instantly recognize the melody through Davis' performance. He remains very true to the shape of the melody, but then strategically departs from it in a very natural fashion as seen in measures 11 and 27. Yet he also inserts short moments of improvisation during the melody (measures 15/16 and 27/28). And the melodic figure in measure 26 is employed in the same part of the form during his solos (measures 61 and 96). What a great lesson in learning, owning and reinterpreting a theme. Rhythm. Jazz musicians often fear simplicity. Davis' solo is almost entirely eighth notes and quarter notes. The rhythmic phrases that bring the biggest smile on my face are in measures 50 and 82 (1'55" and 2'42" ). Quarter notes and half notes, doesn't get much simpler than that. And it's perfect! It's exactly what you want to hear in that moment of the tune. It's so simple and so good, you wonder if it's part of the initial melody. At first listen, your ear probably perks up at measure 58 (2'08") thinking to yourself, "did he mean to play that?" Who knows? But he owns it and expands on it. I have a feeling I am not the only listener who had questions about that part of his solo. In analyzing this recording, I listened to other recordings of this tune, (Bill Evans, John Coltrane, Keith Jarrett, and Chick Corea). On Chick Corea's live recording of "On Green Dolphin Street" with his "Akoustic Band" featuring John Patitucci on bass and Dave Weckl on drums, Patitucci can be heard quoting that part of Davis' solo in his own solo. I was pretty shocked to hear someone quote part of someone else's solo (a testament to Davis' solo) and find it kind of funny that a bassist would quote a trumpet player. Ok, don't want to get too "jazz school" on you guys, but hope you enjoy this recording and find this transcription helpful. It has surely helped me in understanding this song better and has sharpened my musical tools, not only in jazz, but also for other musical situations. This blog series will be a collection of musical encounters, experiences and endeavors in my day to day life as a working musician. I cannot tell you what I will be covering exactly, but it will include a combination of music I am preparing for certain gigs, music I am personally working on and recorded and live music. The blog, much like my previous series, will include analyses and also a personal perspective on the music. So please check out the upcoming blog and also let me know if there is any music you think I should be listening to. This is the final entry in my "This Moment In Time" blog series. We'll Meet Again is an old standard from the World War II era that offers a romantically hopeful message of reunion. For a season, while on tour with Engelbert, this was the encore song, done in a big band style. For those of you who may have only downloaded this track, I hope you don't feel cheated as it's only 95 seconds in length. My musical intent of recording this track was two fold: one as a tip of the hat to when the show would conclude with this song, and in much the same way, conclude the album, secondly, I wanted to offer a short, intimate and hopeful statement that we will meet again. Thank you everyone for following along with this, my first blog series, these last several months. I hope you have enjoyed this personal perspective into "This Moment In Time". It has been such a delight sharing about all of these tracks and I hope that it has personalized each song and the album a bit more. Every Engelbert fan should know that Release Me is his iconic hit that launched his career. So any album covering his music is not complete without this tune. As I might have written in and earlier blog or as mentioned in my bio, I grew up in Texas. I will confess that as I child, I was not a fan of country music. In fact, I made every attempt to avoid it, (which is NOT easy in Texas). Ironically, in California, it began to grow on me, and now living in New York, I can, with all sincerity, say that I'm a fan of country music. (Even found myself watching the Country Music Awards recently). Well, I mention this, because this big hit of Engelbert is country tune in the style of Johnny Cash or maybe Glenn Campbell, but the curious fact that an English man interpreted it and made such a huge hit out of it is fascinating. In Engelbert's recording, one of the things I admire is the simplicity in the arrangement and production. The rhythm section is not doing anything fancy, the orchestra and background vocals create a warm pad, but remain in the background. So in recording this classic, I also wanted to keep it simple. The intro is an open vamp of the first two chords, creating a meditative question and answer tone. I also decided to slow the tempo slightly so I could emphasize a subtle rhythmic subdivision in my playing. Harmonically, the song is pretty much three chords, but you may hear the occasional secondary dominant substitutions (more on the 2nd & 3rd chorus) that I throw in in the style of gospel music. This taps into my roots growing up as a Southern Baptist Church pianist. And a tip of the hat to traditional country music, I use the obligatory Floyd Cramer lick. And I finally end the song with tag found on Engelbert's recording. The Last Waltz is a timeless song written by Barry Mason and Les Reed and was a # 1 hit for Engelbert in 1967. I placed it towards the end of album since it is almost always towards the end of Engelbert's shows followed by his classic hit and an encore. When I play the iconic rolled chords to start the song at Engelbert concerts, the audience typically responds with a warm applause. I wanted to keep that "hook" in my interpretation, but in classic Alex-fashion, with a slight variation. I roll the 1st & 3rd chords and in the left hand, I add a G natural to the Db chord creating a lydian - mode sound (think The Simpson or Maria from West Side Story). This song, a bit like track 8 (This Is My Song), The Last Waltz is in a triple meter. When your title includes the word waltz, you are practically obligated to compose it in 3/4 time signature. So one element I did not want to lose was the waltz, dance feel, but also, when you depart from the more conventional 4/4 time signature, you find yourself with an array of new rhythmic possibilities. One of the examples of me playing with the rhythm is found in the bridge (2'02"). I integrate 8th note triplets, but then shift the accent of those triplets to give the music an accelerated feel . (It's a little musical trick that I like to use and one that I learned from tradition Peruvian music). A second little trick or more like a stolen tribute is found on the last chorus (2'39") and it's a "tip of the hat" to long time Engelbert drummer, Tony Savage. The song has a shuffled 3/4 feel, but on that chorus, Tony would play the 8th notes straight for about a measure and it was something that everyone in the band would jump in on. Musically, it has the opposite affect of what I did on the bridge, in that it almost puts the breaks on the tune. It makes total sense as the song begins to wind down at that point. I hope you enjoy this beautiful waltz for it's compositional merit, the story behind its lyric and the interpretive nuances in this recording. Track 9 is a quiet, reflective original piece. I will confess that I went into the studio without a title for this song, but the phrase "Echos In An Empty Room" was tossed around by some people in the studio. I guess in their opinion, that's what the song sounded like. Which after some thought, felt true in the moment, but more importantly in the song's conception. As I shared in earlier blogs, I moved from California to New York a couple of years ago. During the last few months in my Orange County home, I made a valiant effort to sell, donate and give away a lot of my furniture or possessions that I knew would not fit into a Manhattan studio and maybe poetically not fit in my New York life. One lazy and lonely afternoon, I sat at my piano, one of the last remaining pieces of furniture left in my living room, and began playing this left hand ostinato pattern. I wanted to capture this sensation of promising emptiness. My home was practically as empty as the day I moved in. The notes don't really define a major or minor tonality. It's not until the melody's second phrase that you hear that the key is major. The first pass of the melody is in a high register, giving a sensation of suspension within a vacuum or something spacey like that. The intro ostinato repeats and the melody reenters an octave lower. At 1'50" you finally hear a secondary melody or theme in the right hand and the bass note changes to a D. The funny thing is that the flowing ostinato pattern of the left hand remains the same throughout both melodies and bass notes. The B section is repeated before the piece begins to slowly fade to its beginning. "So love, this is my song, here is a song, a serenade to you". I love the use of musical references in the lyric to express the emotion of the story. And Engelbert's classic recording off of his debut 1967 Release Me album is timeless, ending the song with arguably an operatic sustained high G.
The song is in a triple meter and so I decided to play with that a bit and interpret it in more of a soulful 3 feel...(think Aretha Franklin's "Natural Woman"). I did try to stay true to the rubato intro of Engelbert's introduction with it's "Floyd Cramer" type piano licks, but then go into the soulful/gospel 3/4 feel on the chorus. Whenever I play this song, be it for Engelbert or on my own gig, there is something prideful and empowering about playing a tune entitled "This Is My Song". One of the greatest rewards of being a musician is sharing your "voice" and having who you are reflect in your music, and I feel that every time I play this composition. Since the release of "This Moment In Time", I have received typically two responses from this track, one dealing with the title and the other with the quality of the composition. I wrote this tune while preparing for my "Closer Than You Think" CD release shows in New York back in November of 2009. The album had already been released in August and recorded in March, with compositions originating from months to years prior. So despite being a CD release concert, I was anxious to compose new material. And by this moment in time (haha), I had already decided to move to NY. The working title I had for the composition was simply "New York Tune" and besides the city, the inspiration behind the song was the voice of a dear friend, Gregory Clark, who sang at my NY shows. The opening melodic interval is a fifth going from B up to F# and back down to B with a harmonic sequence of G-C#7sus-Cmaj7. I love the piano, but one of its handicaps is the inability to slide up and down between notes like a guitar, cello or the human voice. When composing the piece, I simple sang the opening interval over the chord progression with a sliding, almost yawning, falsetto approach. This range and effect played right into Greg's vocal talents. As you might have read on earlier blog entries, the concept of "This Moment In Time" came to me in February of 2012 and from the strong encouragement of music professionals and friends, I decided to include originals. This tune came to mind and so did Greg's voice. On the 20th of March, Greg suffered a sudden heart attack and died at the young age of 44. Anyone who knew Greg, instantly fell in love with him, even if you couldn't stand him. He had two professional "nicknames" per se, "Big Voice" and "Gregarious" and both could not be more fitting. His voice, his personality, his opinions, and most importantly, his heart were huge! This man was the voice in NY, with too many credits to list. His last gig being a vocalist and vocal contractor for the television show "Smash". I owe many of the connections I have made in NY to Gregory. He introduced me to so many people, he let me stay at his apartment, he helped me decorate my place, he encouraged me and validated me when he had no reason to and in my New York "green-ness", had not earned. There are never enough words when you lose someone. I knew him for only a few years, but miss him every day. I cannot imagine the ones who knew him longer or for a lifetime. As an offering to Gregory Clark, to always remember him and to celebrate who he was and who he still is in the lives he has touched, I give you "Gregarious". Track six on the album is "A Man Without Love". Originally an Italian composition entitled "Quando M'innamoro", I discovered from my mother over Christmas, (when I returned home and shared the album with family), that it was also a hit in Spanish under the title "Cuando Me Enamoro", which translates verbatim from the Italian, "When I Fall In Love". Engelbert made the English translation, (A Man Without Love), a hit on his 1968 album release under the same title. I find it kind of funny that the English translation takes a different perspective; "A Man Without Love" versus the Italian and Spanish, "When I Fall In Love". One arguably pessimistic or matter-of-fact and the other optimistic or hopeful. With Italian and Spanish cultures being Latin-based, maybe it's a reflection on views towards love as compared to Anglo cultures...(just a theory). Regardless on how you view it, there is no arguing that it is a classic and infectious melody. Engelbert's recording has an identifiable nylon guitar line at the introduction and again after the first chorus. I reference it, but in a simpler manner. (Originally a 16th note pattern, I play it as an 8th note motif). This creates a flowing, half-time feel. Musically, you may say it's a hybrid of a classical sonatina style fused with a Coldplay (or other modern day piano-based pop/rock band) approach. Track five on the album, Two Different Worlds, is a 1956 Al Frisch composition recorded by Humperdinck on his 1967 album, The Last Waltz. Much like The Hungry Years, this particular song left a strong musical impression on me. And also like my interpretation of The Hungry Years, I chose not to stray too far from the original arrangement as compared to some of the other selections. Musically, I love the introduction on Engelbert's recording. There is this sensation of suspension or floating on clouds created by celeste or vibes and a choir. I wanted to capture that sensation on solo piano and decided to simply strike the first chord and then recreate that floating feeling with the melody and the counter line underneath played in single notes. But throughout the intro, you still hear the faint presence of that initial chord. Coincidentally, when I was introduced to this song a few years ago, I was in a long distance relationship. So needless to say, I felt a personal connection to the story. The lyric speaks of a figurative distance that could be interpreted as any number of things and in my case, I definitely felt that, but that feeling was also coupled with a literal distance of a few thousand miles. The song possesses a conquering theme with lyrics like "nothing matters if I am yours and you are mine", but in my heart, the truth of the second line was too strong... "we live in two different worlds". This was not intentional, but I suppose fitting. The following song on the album reveals the outcome of my "Two Different Worlds" love affair. "Outside My Window" is the first of three originals included on the album. This song has two stories. I wrote it shortly after my move to New York. One afternoon, I found myself staring out the window of my East Village apartment wondering what awaited me in such an overwhelming city. Musically, the piece is divided into two sections. The "A" section is comprised of two pairs of questions and answers over two different chords. The "B" section rises to a melodic peak and descends slowly three times with the third time being the most intense as the bass line climbs in a contrary motion. (Sorry for all the "shop-talk", but I feel the musical contour of the piece directly reflects the personal story). The melody, phrasing, shape, and the simple and then more complex harmonies parallel the questioning, anxiety and goal of "cadence" in my life two years ago. About a year after conceiving this melody, I reconnected with a friend in New York. We met for lunch in Union Square and caught up on life. He had been using his creative talents and giving heart towards a wonderful non-profit organization in NYC called Resources for Children with Special Needs. He shared with me a short film that they were producing for an upcoming fundraiser gala in the city hosted by Mayor Bloomberg. I reminded him of my film scoring studies at NYU and collection of original works. I am not a father and I cannot imagine the responsibilities of parenthood, much less the weight of being a parent in New York City with a special needs child, but as I tried to imagine and reflect on friends who could relate to such a situation, I began to think that the theme should not rest on pity, but instead on empowerment. When revisiting compositions of mine, I felt this piece carried a gentle strength behind it that in a humble way paralleled the lives of such families. There is no greater musical reward than to know a creation of yours is touching the lives of others, and I have been blessed over my career to have experienced that joy time and time again. I thank RCSN for allowing my music to be associated with their noble cause and I encourage you to visit their website to read more about the countless ways they touch families in NYC. And beyond that, I challenge you to seek out ways to touch the lives of others outside "your" window. (you can find the video that I scored on their homepage). The third track on the album, The Hungry Years, is one of the most moving pieces of music I have ever heard or played. Written by Neil Sedaka, the lyric talks about reflecting on a time when things were maybe more challenging, but more true. And the music is pure gold, toying between major and minor and jumping back and forth between the keys of G and Bb with the occasional E major resolution. I was first introduced to this song while on the road three years ago. I instantly fell in love with it. Engelbert opened up a bit about how much this song meant to him as he reflected on the early "hungry years" of his marriage. One thing I challenged myself to do while in the studio recording these songs, was to internalize and personalize each and every melody and piece of music. When thinking of the message of The Hungry Years, I could not help but reflect on my own "hungry years". "I miss the hungry years, the once upon a time, the lovely long ago, we didn't have a dime..."
I have been so blessed these last several years with opportunities I could not have imagined as a child. I did grow up with certain hardships, but one thing that was never absent at home was love. And now that I have luxuries and dreams fulfilled, I do confess that I reflect and hunger for "the lovely long ago". During the making of the album, I shared a rough mix of The Hungry Years to Engelbert and his reaction was so powerful. With his eyes closed and a slight swell of tears, Engelbert gave an emotional and personalized endorsement of my interpretation and of the entire project. Check out the youtube link to hear his words. "Looking through my tears, I miss the hungry years." So January of last year, I was on a recording session at Yellow Sound Lab Studios in the East Village in Manhattan. Just the week prior, I had received a call from Engelbert Humperdinck's management to return to the tour as musical director for the 2012 World Tour. So during a recording break at the studio, I decided to brush up on some EH tunes, and the first song that came to mind was his hit, This Moment In Time. I placed my phone next to the piano and recorded a short little video. I will confess that I took some interpretive licence with the melody and harmonies, partly for artistic reasons and also because of simply being a little rusty on that tune. That little musical snapshot was not perfection by any means, but it instantly turned on a switch in my mind and heart to record a collection of Engelbert tunes. The title could not have been more "apropos" as I found myself entering my second year in New York City, 1 week into the age of 35 and simply full of anxiety about my future professionally and personally. Musically, my approach leaned on the side of jazz with possibly some Bill Evans-type colors, but also a sense of minimalism and plenty of room for the melody. I then began brainstorming which songs from his vast catalogue to record, then I was considering production ideas, (band, solo, vocals...etc), and then where to record. Then there was of course the legal and logistical side of such a project. After sorting through all of that, it made the most sense to return to my neighborhood studio, Yellow Sound Lab, and to the comfort of that Yamaha grand. (Below is link to the videos on my Facebook Fan Page...The one titled "This Moment In Time" is the video I shot at the studio last year from my phone). This is the first track on the album. I decided to open with this tune for a few reasons. This is arguably one of Engelbert's biggest hits, but also the musical approach I took I feel sets the tone for the entire album. But also on a personal note, I've always felt a timely connection with this song, as it was a hit the year that I was born! (Engelbert did not share my amusement in that bit of trivia when I mentioned it to him at his house). I decided to go with a straight 8th note feel and open with an open 5th rhythmic ostinato in the left hand, (describing the first few seconds of the intro). That left hand figure was actually leftover from a song I recorded for my first album, (Closer Than You Think), but then decided to omit. I wasn't crazy about the song or the performance, but that little left hand hook I felt was strong and created a sense of suspension and pensiveness. But besides that, I stay true to the key, form melody and modulation of the song as recorded by Engelbert. Someone shared a quote with me about the great Bebo Silvetti (Argentinian pianist/composer/arranger who also worked with Engelbert, arranging "Love Is A Many Splendored Thing"). He said ,(paraphrasing), that a song's introduction is the arranger's chance to compose and really set his mark on the piece. Well, on After The Lovin', arranger, Charles Calello does exactly that with his clever introduction that not only fits the popular style of the late 70's, but also pushes musical boundaries; flirting with three tonal centers and composing a theme/hook that can almost be mistaken for the melody. This hook identifies the song within four notes and is used again at the closing of the arrangement. I felt it would be a crime to not incorporate that element of the song in my recording. I had the great fortune of meeting Mr. Calello in Florida while on tour and briefly picked his brain about his classic arrangement. In the attached video, I am seen working out the arrangement. This was shot at the Steinway Piano Gallery in Melville, Long Island. (Special thanks to Long Islander Newspaper Editor Luann Dallojocano for coordinating and filming the event and for Steinway for hosting me yet again). The video was shot months prior to the recording session while I was still deciding what songs from Engelbert's catalogue to record and how to arrange them musically. (Click on the youtube link below to watch the video). Enjoy...and check back in next week for a discussion of the title track. So I am beginning a 12 part series/blog on my latest album, THIS MOMENT IN TIME. I will be addressing each tune individually; writing about the inspiration, story, musical influence and whatever else comes to mind or fits the tune. My request, (if you haven't already) is to download the entire album or buy/order the CD to follow along tune by tune. But for those of you too afraid of commitment (pot calling the kettle black), I guess you can just download 1 tune at a time at 99¢ a pop. (But in this economic climate, downloading the entire album is far more fiscally prudent). It feels only apropos starting this blog on the eve of my NY, CA, and TX album release tour. So this serves as your heads up to go ahead and download the album or cue up the CD you already bought as I start blogging tomorrow!! !